The Task Manager component is responsible for launching built-in tasks and tasks defined in the Task Launcher component. When you’re creating a new map using the RTS Engine menu editor, this component is attached to an object called “TaskManager”. 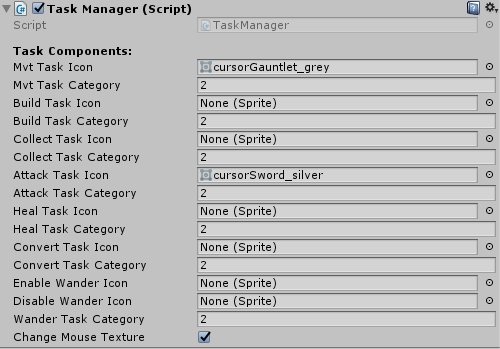 Task Icon & Task Parent Category: Unit commands that the player can initiate using the mouse buttons (move, build, collect resources, attack, heal, collect and wander) can be also represented with tasks in the task panel if the task is assigned a valid icon. For each task you can also pick the task category for further customization. Change Mouse Texture: When enabled, this will change the mouse texture to the correspondent task that the player is asking the unit to do (for example, when the player clicks on the attack task in the task panel while this option is enabled, the mouse cursor will turn into the Attack Task Icon and once the player picks a target, the mouse cursor will have its default sprite again).